TABLE 7.1 Sources of organic matter (OM) to fluvial ecosystems. Much OM originates outside the stream reach where it is measured. Some (sources marked with an asterisk) is produced by photosynthesis within the stream and subsequently enters the pools of dissolved or particulate OM. methods of study are described by Boulton and Boon (1991) and Graca et al. (2005). The breakdown of macrophytes is similar to that of leaves of terrestrial origin, although some minor differences are noted below. The breakdown of woody material is, not surprisingly, much slower than that of leaves, and is of lesser importance to higher trophic levels. 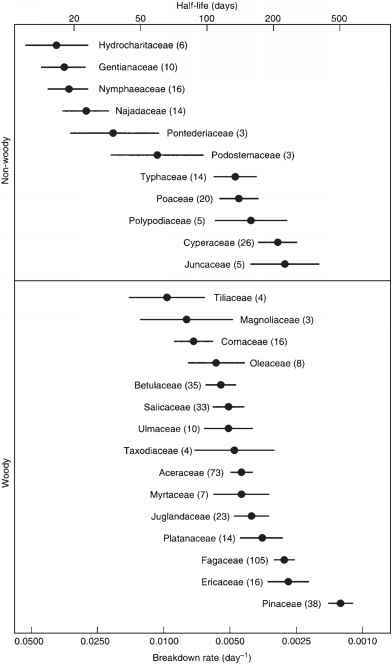 Other sources of CPOM that enter heterotrophic pathways in running waters and may be locally or seasonally important, such as flower parts, animal feces, and carcasses of large animals, have received less study. Once CPOM enters streams it undergoes a breakdown process or is exported (Webster et al. 1999). Studies of OM breakdown start with the source material, often using leaves picked from riparian trees just prior to abscission, and follow its disappearance over time. As the process advances, leaves release solutes and are colonized by microorganisms and invertebrates, which enhance fragmentation and mineralization (the conversion of organic C compounds into inorganic carbon dioxide [CO2]). The original leaf is transformed into several products including microbial and shredder biomass, FPOM, DOM, nutrients, and CO2 (Gessner et al. 1999). DOM and FPOM can undergo further microbial degradation or be transported downstream. 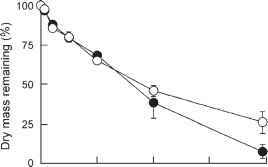 where Wt = dry mass at time t, Wi = initial dry mass, and t is time, measured in days. The statistic k (in units days1), which is the slope of the plot of the natural logarithm of leaf mass versus time, provides a single measure of breakdown rate. among leaves, a number of environmental variables, and the feeding activity of detritivores. Petersen and Cummins (1974) suggested a continuum of decomposition rates from slow to fast, based on the breakdown of leaves from six deciduous tree species in a small Michigan stream. They also recognized that this variation in leaf decomposition rates, which they termed a ''processing continuum,'' had important consequences for invertebrate consumers by extending the time interval over which microbially colonized leaf litter was available. The wide variation in the breakdown rate of the leaves of different plant species has now been amply documented (Figure 7.2). Nonwoody plant leaves decompose much more quickly, on average, than do leaves of woody plants (mean half-lives in Figure 7.2 are approximately 65 days and 100-150 days, respectively). Submerged and floating macrophytes are among the fastest to decay, presumably because they contain the least amount of support tissue and often the highest concentration of potentially limiting elements such as nitrogen (N) and phosphorus (P). 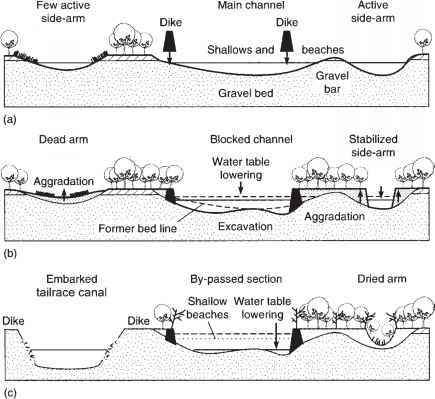 nutrient additions to a stream in the Caribou National Forest in southeast Idaho did not affect leaf breakdown, suggesting that microorganisms were not nutrient limited due to relatively high ambient nutrient concentrations (Royer and Minshall 2001). Low pH retards decomposition by inhibiting the activity of microorganisms and invertebrates (Dangles et al. 2004a). Hydrologic fluctuations can cause abrasion and fragmentation, which may expose more surface area to microbial action (Benfield et al. 2001), and burial, which can reduce microbial activity by reducing the availability of oxygen (Sponseller and Benfield 2001). Metal pollution can decrease decomposition rates by negatively affecting shredders and microorganisms (Niyogi et al. 2001, Duarte et al. 2004, Carlisle and Clements 2005).